The $19/30 days plan now comes with 500 MB of hard capped LTE data instead of 100 MB. The plan also includes unlimited domestic talk and messaging, unlimited international SMS and unlimited calls to landlines in 60 countries and mobile phones in 25. The $49/30 days plan, which until now did not include international calling now comes with unlimited calls to landlines in 60 countries and mobile phones in 25. The $49 plan also includes unlimited domestic voice and messaging , unlimited international SMS and "unlimited" high speed data. Lycamobile says data speeds may be slowed for the rest of the 30 day plan period after 32 GB. $23/30 days - Unlimited data with the first 1 GB of LTE speeds followed by unlimited data at 2G speeds. $1.50/month international call credit. $29/30 days - Unlimited data with the first 4 GB of LTE speeds followed by unlimited data at 2G speeds. $2.50/month international call credit. $35/30 days - Unlimited data with the first 6 GB of LTE speeds followed by unlimited data at 2G speeds. $45/30 days - Unlimited data with the first 7 GB of LTE speeds followed by unlimited data at 2G speeds, 200 domestic roaming minutes and 200 domestic roaming texts. $50/30 days - Unlimited high speed data (may be slowed for the rest of the plan period after 32 GB), 200 domestic roaming minutes and 200 domestic roaming texts. 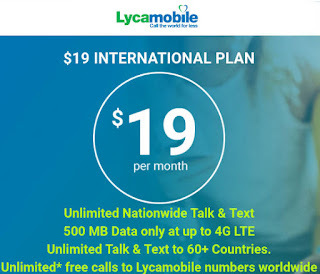 All of Lycamobile's unlimited monthly plans include unlimited domestic talk and messaging, unlimited international SMS, unlimited international Lycamobile to Lycamobile calls and unlimited calls to landlines in 60 countries and mobile phones in 25. Lyca adds a 5% fee to all plans to cover regulatory costs. Hotspot and tethering are prohibited on all Lycamobile plans. Lycamobile's 2G throttled speed has been reported to be 128 kbps or less. New Lycamobile customers can get 20% off their first month when they order online and enter the code LYCA20 at checkout. Students who sign up using an .edu email address can get a 30% discount off their first month with the promo code, STUDENT. The $19 plan is not eligible for either promotion. These changes at Lycamobile match changes that Ultra Mobile, another T-Mobile MVNO, made last month. Lycamobile, Ultra Mobile and Red Pocket Mobile tie in offering the most data (500 MB) at the $20 price point on month to month unlimited talk and messaging plans on T-Mobile. For more about Lycanobile see our Lycamobile Profile post. For more T-Mobile based options see our T-Mobile and T-Mobile MVNO Prepaid Plans Compared post. Source: Lycamobile via Prepaid Mobile Phone Reviews. do Lycamobile, Ultra Mobile and Red Pocket Mobile sell their own phones and if not what bands does the phone have to have to use on them? Lycamobile sells a few phones. Red Pocket and Ultra don't seem to currently. LTE bands 2, 4 and 12. LTE bands 66 and 71 are nice to have but they are new, not widely deployed yet and not supported by many phones. The phone must also either be unlocked or locked to T-Mobile. Lyca mobile has bad customer service. https://www.trustpilot.com/review/lycamobile.dk. Lycamobile is currently running a promotion with their $23 plan: buy 3 months and get 3GB of data instead of only 1GB. I went for it; my current plan is still good until later this month, so I can't confirm it really works yet.